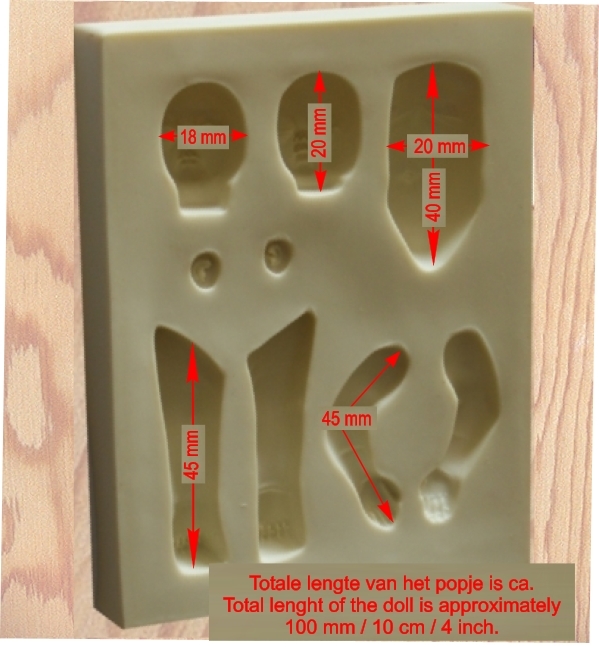 Use this to model the detailed professional mold, baby is in just to create minutes. Modeling with this very detailed dolls mold! The baby is mold includes: torso, arms, legs, and a head of the sleep and awake up baby head. Place unbaked sculpt in the oven then turn the oven on preheat to 275 °F/135 °C and let the sculpt warm up with the oven. Once the oven reaches the temperature bake the sculpt for another 15 minutes. When the baking time is finished let the oven cool down completely before removing sculpt from the oven. If you remove the sculpt from the oven while still hot you may cause the clay to crack. If you purchased Real Eyes Brand Doll Eyes (the only brand Secrist sells) to use with your sculpting form then you don't have to worry about them melting or changing colors during the baking time! The sculpting foundation was developed to help sculptors produce more symmetrical baby heads and to be able to completely finish them in a lot less time. Experienced sculptors such as Vickie Reid can literally sculpt a complete baby head in about 60 minutes using this sculpting form. If you were to set water-based clay on a towel you would notice that the water in the clay migrates to the towel. If left there long enough the clay would begin to crack. The water is what keeps the clay soft. In the same way one of the materials that keeps polymer clays soft is an ingredient called a plasticizer. And like the water in the water-based clay the plasticizer can migrate out of the polymer clay into another material. If too much plasticizer leaves the polymer clay then it too will begin to crack. Water-based clays have a time frame in which you can work with them out in the open air without any detrimental effects. If you wish to extend the working time from hours to perhaps days then you must employ a barrier between the air and the water-based clay. Most people will put a plastic bag over the wet clay to keep it from drying out. In that way you can keep working with the clay for several weeks. Polymer clays are not water-based but they can in a way "dry out" and crack if a barrier is not employed to keep the plasticizer from leaving the clay. Plasticizer can leave the clay by migrating into a porous surface that it comes in contact with. One of the great things about using polymer clays on our sculpting form is that you have up to 2 weeks in which to complete and bake your baby head without the need of a barrier. If you wish to work beyond that time frame then you can extend the workable life of the clay for months by applying a barrier over the sculpting form. This barrier can be something as simple as aluminum foil. Aluminum foil is non-porous so plasticizer can not migrate through it causing the clay to "dry out". If you intend to complete and bake the head in less than 2 weeks then you will not need a barrier at all. Once polymer clay is completely baked it becomes impervious to cracking from loss of plasticizer. The clay will adhere to the form making the sculpt very durable and long lasting. Another idea for creating a barrier is to apply the first layer of clay on the form then bake it. This first layer should be about 1/8 inch thick. A craft-grade pasta machine works very well to produce sheets of clay this thick. Once the first layer is baked then you can take as long as you like to add and finish the second 1/8 inch thick layer of clay. Your first layer of "baked" clay now becomes your plasticizer barrier. If you want an open-eyed baby then be sure to open the eyes before you bake the first layer of clay. Keep your hands clean at all times whenever sculpting. Be sure to use baby wipes as you sculpt your baby head so that dirt on your hands and fingers won't get into your clay. Once in the clay the dirt is nearly impossible to get out. Wipe your fingers off at every step in order to prevent skin oils and dirt from transferring to the clay. Don't trust oven settings. Every oven is different so use an oven thermometer to verify the proper oven temperature to bake your polymer clay in. Over baking may discolor your sculpt.